His Eminence, the Most Reverend Justinian (Ovchinnikov), (Russian:Юстиниан Овчинников) is an archbishop of the Church of Russia. He was formerly the Administrator of the Russian Orthodox Church in the USA that consists of the parishes in the United States that are directly under the canonical authority of the Church of Russia (2010-2014). Abp. Justinian was also the Second Vice Chairman of the Episcopal Assembly of North and Central America. Abp. Justinian was born on January 28, 1961 in Kosterevo, Vladimir Oblast. After completing his secondary education, in 1978, he entered Ivanovo State University, graduating in 1983. From July 1983 to July 1984, he served as senior subdeacon of Archbishop Amvrosy (Shchurov) of Ivanovo and Kineshma. In 1984, he entered the Moscow Theological Seminary, taking time out to serve in the Soviet army in 1985 and 1986. After returning from the army, he continued his studies at the Moscow Seminary from 1986 to 1988 while serving as subdeacon to the rector of the seminary, Bishop Alexander (Timofeyev) of Dmitrov. On March 24, 1988, he received his monastic tonsure and name, Justinian, after Justinian the Great. He was ordained deacon on June 26, 1988, and then hieromonk. Also, in 1988 Hmk. Justinian entered the Theological Institute in Bucharest, Romania from which he graduated in 1992 with the degree of Master of Theology. After his graduation he returned to serve in the Department of External Church Relations, during which time he also served as senior priest in Holy Trinity Cathedral in Kalinin (Tver). In 1992, he was elevated to the dignity of hegumen and served from November 18, 1992 to September 1995 as Father Superior of the Ascension Cathedral in Tver. He was consecrated a bishop in Donskoy monastery in Moscow on September 1, 1995, as Bishop of Dubossary, Vicar of the Diocese of Kishinev. On October 6, 1998 he was appointed Bishop of the newly established Diocese of Tiraspol and Dubossary. On February 25, 2008, Bishop Justinian was elevated to the rank of Archbishop. 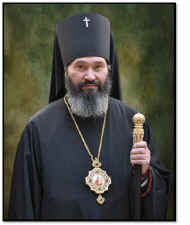 On March 5, 2010, the Holy Synod of Russian Orthodox Church appointed Archbishop Justinian administrator of Patriarchal parishes in the USA with the title of Archbishop of Naro-Fominsk, a post in which he served until 2014. Abp. Justinian has received a number of church and secular rewards for his work. This page was last edited on June 19, 2015, at 18:28.